Servers « Global Market Insights, Inc. The unprecedented evolution of cloud computing technology is undeniably driving new levels of innovation in data center networking industry. The extensive penetration of Internet of Things (IoT) has brought a renewed dimension in the business model, where the modern change in traffic patterns expose the limitation of conventional network. In the light of the recent scenario, data center networks are expected to exhibit not only scalability and high performance, but also flexibility, agility, and enhanced automation. Companies ranging from enterprises to cloud service providers are highly influenced by the growing trend of data & network virtualization and are seeking to integrate advanced technology solutions to curtail the overall operational expenditure. Incidentally this has encouraged core tech juggernauts to come up with newer innovations that could potentially change data center networking market dynamics. Globally acclaimed SDN solution provider, Nokia’s Nuage Networks recently made its way to the front page with its latest data center transformation projects with China Mobile and Spanish multinational broadband, Telefónica. Reportedly in both these projects, Nuage’s VNS (Virtualized Networks Services) has been used in a bid to provide more elasticity to these data center sites. Nuage Networks’ initiatives, as per experts’ opinion, coherently depict the progress of data center networking industry toward network slicing with SDN (software-defined networking). For the records, Telefónica worked with Nuage in order to leverage its hefty yesteryear investment in SD-WAN infrastructure. The integration of VNS solution in its service is further to offer enterprises the facility of configuring and customizing value added services via a self-service portal. Not to mention, the extensive growth of cloud computing technology has indeed proved to be a catalyst in sowing the seeds for advancing the innovation in data center networking market. In yet another turn of events, American tech conglomerate, IBM Corporation last year announced its plan of launching four new data centers in the United States, in a bid to support the surging demand for cognitive capabilities. Experts believe the project is sure to leave a perpetual impact on U.S. data center networking market, as the transition to cloud-based software would necessitate the requirement of replacing the traditional networks. In fact, U.S. and Canada conjointly held almost a lion’s share (40%) of data center networking industry in 2017. The subtly changing trends toward cloud-based software in tandem with growing popularity of streaming devices and social media is claimed to be a sure shot indicator of the fact that U.S. would experience an upper hand in data center networking industry over the ensuing years. Data center networking market giants are betting big on highly advanced storage and memory technologies to gain a competitive edge. Klas Telecom for instance, has recently released an upgraded version of Voyager TDC. Christened as Voyager TDC 2.0, this groundbreaking technology claims to provide users the flexibility of the original system, in addition to NVMe and double storage capacity that ensure better and faster performance. If reports are to be relied on, the company will demonstrate how users can integrate AI and machine learning technology at tactical edge, leveraging the ultra-high-power process capability of Voyager TDC at SOFIC 2018. Yet another trend that is quite vivid in the competitive terrain of data center networking industry is technological proliferation via strategic partnerships. 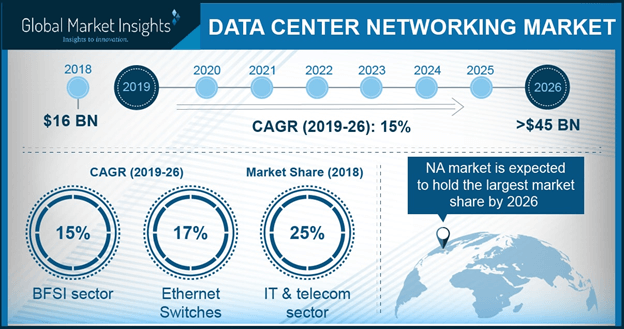 All in all, aided by the vast technology landscape where myriad companies are becoming consumer centric and data driven, data center networking market share is forecast to exceed a valuation of USD 35 billion by 2024. This entry was posted in Electronics and Media and tagged ADC, Application Delivery Controller, BFSI, Colocation, Component, Data Center Networking Market, Data Center Networking Market Analysis, Data Center Networking Market Report, Data Center Networking Market Share, Data Center Networking Market Size, ENERGY, Ethernet Switches, Government, Healthcare, IT & Telecom, Managed, Manufacturing, Professional, Routers, Servers, Service, Solution.